Industry 4.0 what does it mean for your Supply Chain? First edition - start on November 30, 2017. The 4th industrial revolution is upon us, data is becoming the most precious commodity of the 21st century. Hence, the value proposition for customers is changing radically and business models must evolve at high speed. What will be the impact on your supply chain and enterprise when Industry 4.0 becomes a reality? Is your business model robust to a world where open standards, information and automation offer flexible and fast production anywhere for anyone? Do you leverage the value of the data flows associated to your processes? 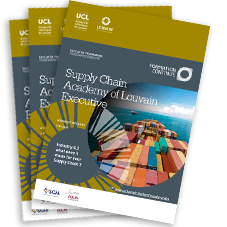 The programme is designed for managers holding a university degree (or equivalent) with at least five years of experience aiming to master the most recent challenges in supply chain management. Duration: 6 Days (2 modules of 3 days). Schedule: Each module lasts for three days, from Thursday through Saturday from 9:00 a.m. to 5:00 p.m. Tuition fees: 3.900 EUR (excl. VAT) for two modules or 2.300 EUR (excl. VAT) per module. This includes instruction, teaching and pedagogical material, course facilities, coffee breaks and lunches. Members of Abcal, Agoria, LiW, PICS are entitled to a discount of 10 %. The two modules balance theoretical highlights with on-site practical case studies developed with local enterprises and in-house management. PER AGRELL, Professor of Operations Management at LSM, Academic Director IEMBA, Member of the Center for Operations Research and Econometrics (CORE). CONSTANTIN BLOME, Kronos Chaired Professor of Sourcing at LSM, Member of the Center of Operations Research and Econometrics (CORE) at LSM and Professor of Operations Management at University of Sussex. PHILIPPE CHEVALIER, Professor of Operations Management and Management Science at LSM and President of the Center for Operations Research and Econometrics (CORE) and of the Institute for Multidisciplinary Research in Quantitative Modelling and Analysis (IMMAQ). PIERRE SEMAL, Academic Director of the SCALE programme and Professor of Supply Chain Management at LSM. MATHIEU VAN VYVE, Professor of Operations Research at the LSM, Director of the Center for Supply Chain Management (CESCM), Head of the Operations and Information Systems department (OIS) and Member of the Center for Operations Research and Econometrics (CORE). In addition, the teaching team is made up of a pool of experts and professionals in supply chain.